Quebec ~ Tune in tomorrow morning, Sunday 27 October, to 88.5 FM CBC Radio One, for Veena Gokhale’s feature on “All in a Weekend” with Sonali Karnick. The whole show, with many entertaining goodies and a giveaway of BOMBAY WALI, runs from 6 – 9 am. Twelve stories that provide startling glimpses of contemporary life in Bombay, and elsewhere. A wealthy business woman compelled by the desire to hurt her best friend; an old woman in a Tokyo apartment seeking the touch of a baby’s hand; a woman reflecting on violence as a riot rages outside her home. Tales about friendship and repulsion, family ties and freedom; violence, public and private; ambition and uncertainty, alienation and acceptance, growing up and growing old. 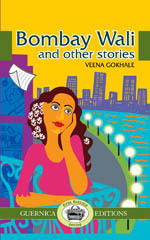 Veena Gokhale started her career in the mercurial world of print journalism in Bombay, in the 1980s. She first came to Canada on a journalism fellowship, returning to do a Masters in Environmental Studies in Toronto. After immigrating, she worked in communications for non-profit organizations, which included a two-year stint in Tanzania. She has published fiction and poetry in anthologies and literary journals, and read from her work. In 2011, she received a grant from Vivacité Montréal, Quebec Arts Council, to write her first novel. She is currently marketing that book. She lives in Montreal with her partner, Marc-Antoine.